In order to use the DKIM you have to contact us first as accounts, as a standard, does not have acces to DKIM configuration. Contact support@ubivox.com and we will enable you account acces to customize the DKIM configuration. In order to use a custom DKIM identity, you need to configure the Ubivox system with a pair of RSA keys. 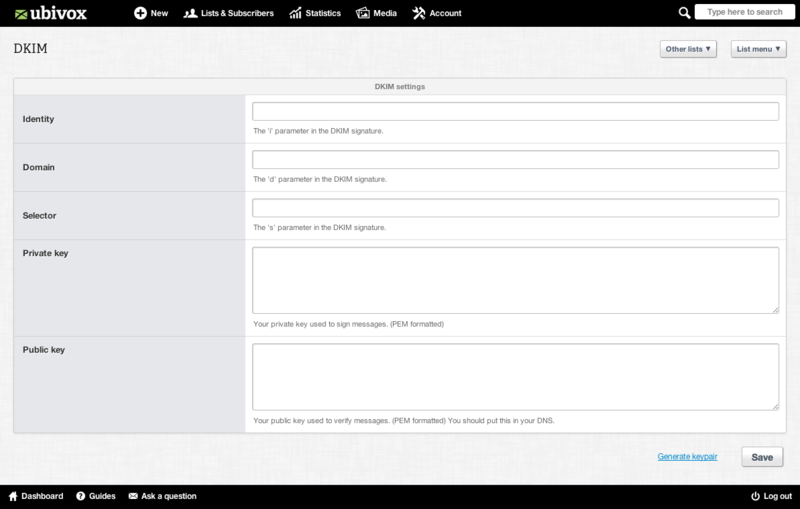 When on the Dashboard, click your list title, click List menu in the top right corner of the next page and click DKIM. Private key: The RSA private key (min. 1024 bits). Public key: The corresponding public key. You may use existing keys or have Ubivox generate keys for you by going to the DKIM setup page and clicking Generate key pair. If you let Ubivox generate a key pair, click the link, copy the key pair to a safe place and go ahead configuring the DNS. Afterwards, go to the Ubivox configuration page again and paste in the keys Ubivox generated for you. If you make an error and need to update the public key remember that DNS is cached and therefore it might take some time for the update to be visible. In Ubivox you can import receivers from Excel CSV files. This guide is based on an Excel file. The guide guides you through the import process through an example.